The outer, middle, and inner structures of the ear collect sound energy, converting it to audible sound. The human ear can be divided into three functional segments: the outer ear, the middle ear, and the inner ear. Sound waves are collected by the pinna, travel through the auditory canal, and cause vibration of the tympanum (ear drum). The three ossicles of the middle ear ( malleus, incus, and stapes ) transfer energy from the vibrating ear drum to the inner ear. 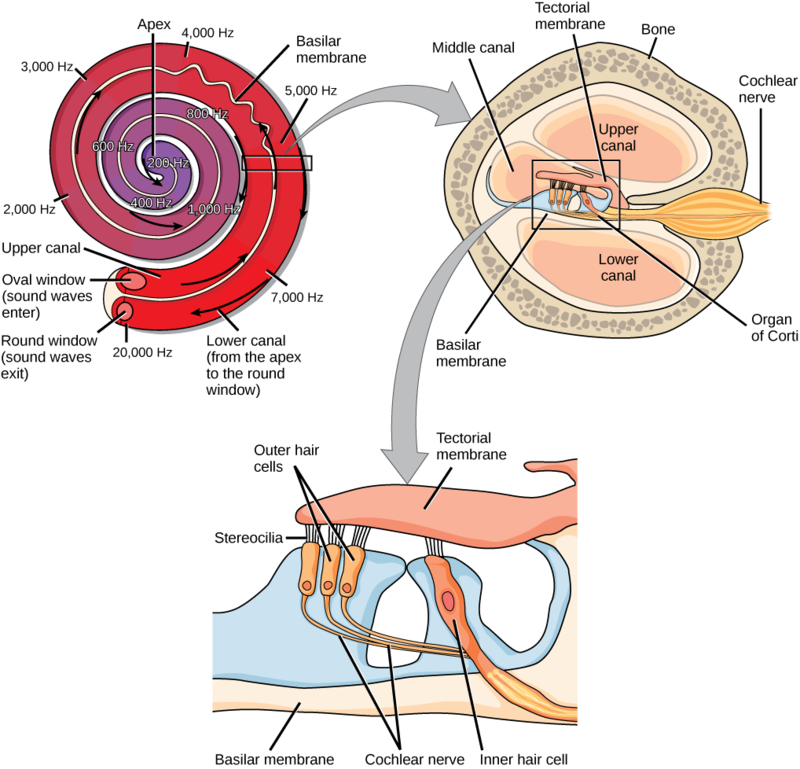 The incus connects the malleus to the stapes, which allows vibrations to reach the inner ear. In order to hear a sound, the auditory system must accomplish three basic tasks. First, it must deliver the acoustic stimulus to the receptors; second, it must convert the stimulus from pressure changes into electrical signals; and third, it must process these electrical signals so that they can efficiently indicate the qualities of the sound source, such as frequency (pitch), amplitude (loudness, volume), and location. In mammals, sound waves are collected by the external, cartilaginous outer part of the ear called the pinna. They then travel through the auditory canal, causing vibration of the thin diaphragm called the tympanum, or ear drum, the innermost part of the outer ear. Interior to the tympanum is the middle ear, which holds three small bones called the ossicles (“little bones”), that transfer energy from the moving tympanum to the inner ear. The three ossicles are the malleus (also known as the hammer), the incus (the anvil), and stapes (the stirrup). The three ossicles are unique to mammals; each plays a role in hearing. The malleus attaches at three points to the interior surface of the tympanic membrane. The incus attaches the malleus to the stapes. In humans, the stapes is not long enough to reach the tympanum. If we did not have the malleus and the incus, then the vibrations of the tympanum would never reach the inner ear. These bones also function to collect force and amplify sounds. The ear ossicles are homologous to bones in a fish mouth; the bones that support gills in fish are thought to be adapted for use in the vertebrate ear over evolutionary time. Many animals (frogs, reptiles, and birds, for example) use the stapes of the middle ear to transmit vibrations to it. Human ear: Sound travels through the outer ear to the middle ear, which is bounded on its exterior by the tympanic membrane. The middle ear contains three bones called ossicles that transfer the sound wave to the oval window, the exterior boundary of the inner ear. When sound waves reach the ear, the ear transduces this mechanical stimulus (pressure) into a nerve impulse (electrical signal) that the brain perceives as sound. The human ear has three distinct functional regions: the outer ear, which collects sound waves; the middle ear, which represents the sound waves as pressure, and the inner ear, which converts those pressure signals into electrical signals that the brain perceives as sound. The outer ear involves the pinna (the external shell-shaped structure on the outside of the head), which assists in collecting sound waves; the meatus (the external canal); and the tympanic membrane, also known as the eardrum. 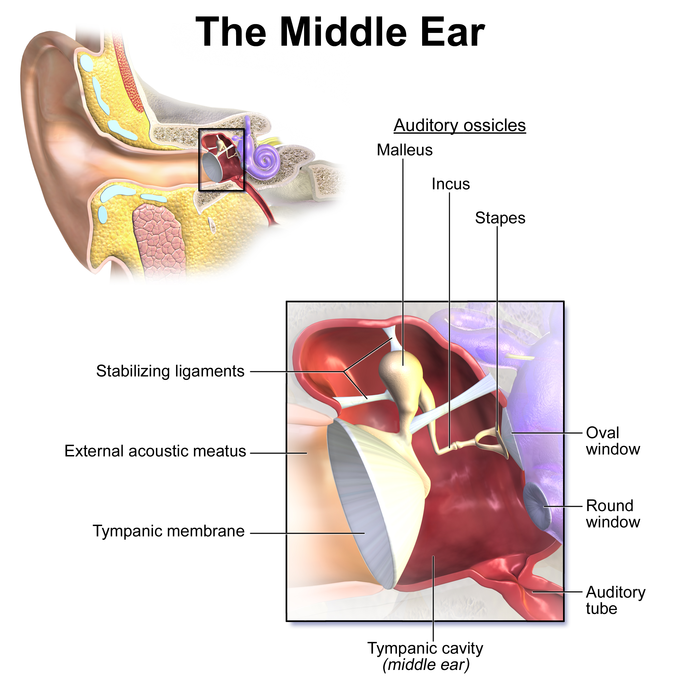 The middle ear exists between the eardrum and the oval window (the external border with the inner ear) and consists of three separate bones: the malleus, the incus, and the stapes. While the middle ear cavity is filled with air, the inner ear is filled with fluid. 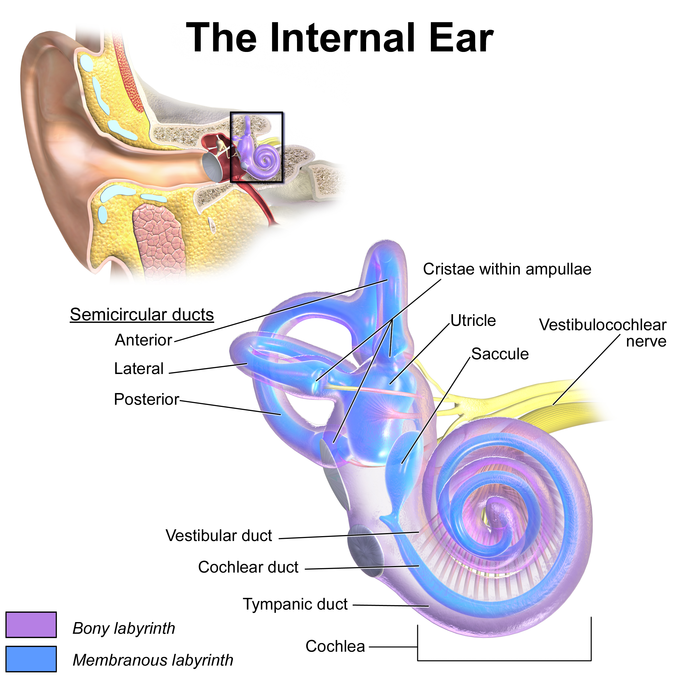 The inner ear exists on the other side of the oval window from the middle ear, by the temple of the human head, and consists of three parts: the semicircular canals, the vestibule, and the cochlea. Within the cochlea, the inner hair cells are most important for conveying auditory information to the brain. 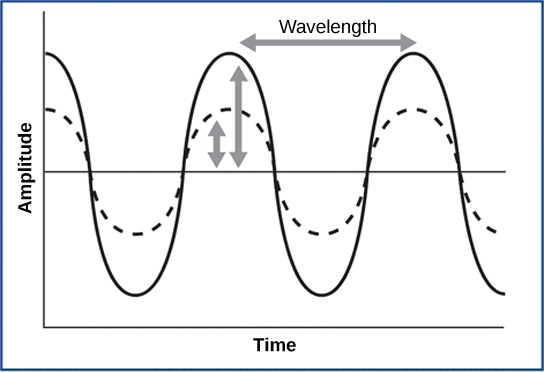 Vibrating objects, such as vocal cords, create sound waves or pressure waves in the air. When these pressure waves reach the ear, the ear transduces this mechanical stimulus (pressure wave) into a nerve impulse (electrical signal) that the brain perceives as sound. The pressure waves strike the tympanum, causing it to vibrate. The mechanical energy from the moving tympanum transmits the vibrations to the three bones of the middle ear. The stapes transmits the vibrations to a thin diaphragm called the oval window, which is the outermost structure of the inner ear. 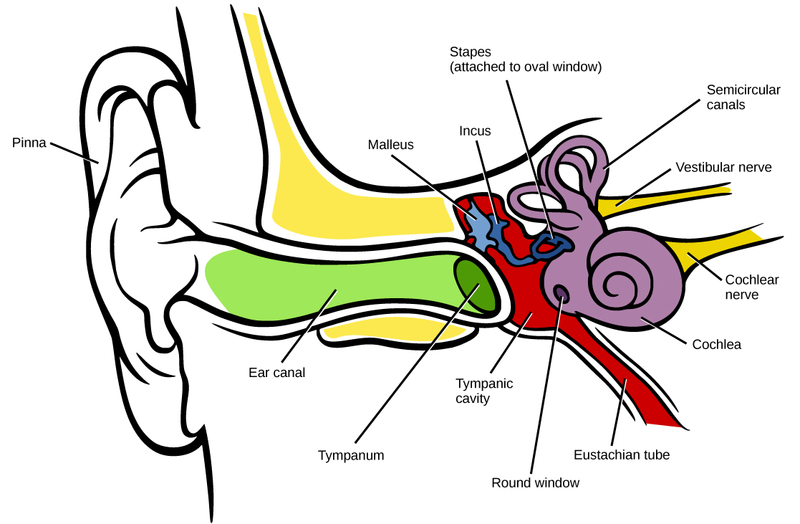 Diagram of the middle ear: The middle ear exists between the tympanic membrane (the boundary with the outer ear) and the oval window (the boundary with the inner ear) and consists of three bones: the malleus (meaning hammer), the incus (meaning anvil), and the stapes (meaning stirrup). The structures of the inner ear are found in the labyrinth, a bony, hollow structure that is the most interior portion of the ear. Here, the energy from the sound wave is transferred from the stapes through the flexible oval window and to the fluid of the cochlea. The vibrations of the oval window create pressure waves in the fluid (perilymph) inside the cochlea. The cochlea is a whorled structure, like the shell of a snail, and it contains receptors for transduction of the mechanical wave into an electrical signal. Inside the cochlea, the basilar membrane is a mechanical analyzer that runs the length of the cochlea, curling toward the cochlea’s center. Inner ear: The inner ear can be divided into three parts: the semicircular canals, the vestibule, and the cochlea, all of which are located in the temporal bone. The mechanical properties of the basilar membrane change along its length, such that it is thicker, tauter, and narrower at the outside of the whorl (where the cochlea is largest), and thinner, floppier, and broader toward the apex, or center, of the whorl (where the cochlea is smallest). Different regions of the basilar membrane vibrate according to the frequency of the sound wave conducted through the fluid in the cochlea. For these reasons, the fluid-filled cochlea detects different wave frequencies (pitches) at different regions of the membrane. When the sound waves in the cochlear fluid contact the basilar membrane, it flexes back and forth in a wave-like fashion. Above the basilar membrane is the tectorial membrane. Transduction: In the human ear, sound waves cause the stapes to press against the oval window. Vibrations travel up the fluid-filled interior of the cochlea. The basilar membrane that lines the cochlea gets continuously thinner toward the apex of the cochlea. Different thicknesses of membrane vibrate in response to different frequencies of sound. Sound waves then exit through the round window. In the cross section of the cochlea (top right figure), note that in addition to the upper canal and lower canal, the cochlea also has a middle canal. The organ of Corti (bottom image) is the site of sound transduction. Movement of stereocilia on hair cells results in an action potential that travels along the auditory nerve. The site of transduction is in the organ of Corti (spiral organ). It is composed of hair cells held in place above the basilar membrane like flowers projecting up from soil, with their exposed short, hair-like stereocilia contacting or embedded in the tectorial membrane above them. The inner hair cells are the primary auditory receptors and exist in a single row, numbering approximately 3,500. The stereocilia from inner hair cells extend into small dimples on the tectorial membrane’s lower surface. The outer hair cells are arranged in three or four rows. They number approximately 12,000, and they function to fine tune incoming sound waves. The longer stereocilia that project from the outer hair cells actually attach to the tectorial membrane. All of the stereocilia are mechanoreceptors, and when bent by vibrations they respond by opening a gated ion channel (refer to [link]). As a result, the hair cell membrane is depolarized, and a signal is transmitted to the chochlear nerve. Intensity (volume) of sound is determined by how many hair cells at a particular location are stimulated. The hair cells are arranged on the basilar membrane in an orderly way. The basilar membrane vibrates in different regions, according to the frequency of the sound waves impinging on it. Likewise, the hair cells that lay above it are most sensitive to a specific frequency of sound waves. Hair cells can respond to a small range of similar frequencies, but they require stimulation of greater intensity to fire at frequencies outside of their optimal range. The difference in response frequency between adjacent inner hair cells is about 0.2 percent. Compare that to adjacent piano strings, which are about six percent different. Place theory, which is the model for how biologists think pitch detection works in the human ear, states that high frequency sounds selectively vibrate the basilar membrane of the inner ear near the entrance port (the oval window). Lower frequencies travel farther along the membrane before causing appreciable excitation of the membrane. The basic pitch-determining mechanism is based on the location along the membrane where the hair cells are stimulated. The place theory is the first step toward an understanding of pitch perception. Considering the extreme pitch sensitivity of the human ear, it is thought that there must be some auditory “sharpening” mechanism to enhance the pitch resolution. When sound waves produce fluid waves inside the cochlea, the basilar membrane flexes, bending the stereocilia that attach to the tectorial membrane. Their bending results in action potentials in the hair cells, and auditory information travels along the neural endings of the bipolar neurons of the hair cells (collectively, the auditory nerve) to the brain. When the hairs bend, they release an excitatory neurotransmitter at a synapse with a sensory neuron, which then conducts action potentials to the central nervous system. The cochlear branch of the vestibulocochlear cranial nerve sends information on hearing. The auditory system is very refined, and there is some modulation or “sharpening” built in. The brain can send signals back to the cochlea, resulting in a change of length in the outer hair cells, sharpening or dampening the hair cells’ response to certain frequencies. The inner hair cells are most important for conveying auditory information to the brain. About 90 percent of the afferent neurons carry information from inner hair cells, with each hair cell synapsing with 10 or so neurons. Outer hair cells connect to only 10 percent of the afferent neurons, and each afferent neuron innervates many hair cells. The afferent, bipolar neurons that convey auditory information travel from the cochlea to the medulla, through the pons and midbrain in the brainstem, finally reaching the primary auditory cortex in the temporal lobe. Gravity, acceleration, and deceleration are detected by evaluating the inertia on receptive cells in the vestibular system. The vestibular system uses hair cells, as does the auditory system, but it excites them in different ways. There are five vestibular receptor organs in the inner ear (the vestibular labyrinth): the utricle, the saccule, and three semicircular canals; the utricle and saccule respond to acceleration in a straight line, such as gravity. The bending of the stereocilia stimulates specific neurons that signal to the brain that the head is tilted, allowing the maintenance of balance. The fluid-filled semicircular canals are tubular loops set at oblique angle, arranged in three spatial planes; the base of each canal contains a cluster of hair cells that monitor angular acceleration and deceleration from rotation. Neuronal projections to the temporal cortex account for feelings of dizziness; projections to autonomic nervous system areas in the brainstem account for motion sickness; and projections to the primary somatosensory cortex monitor subjective measurements of the external world and self-movement. The stimuli associated with the vestibular system are linear acceleration (gravity) and angular acceleration/deceleration. Gravity, acceleration, and deceleration are detected by evaluating the inertia on receptive cells in the vestibular system. Gravity is detected through head position, while angular acceleration and deceleration are expressed through turning or tilting of the head. The vestibular system has some similarities with the auditory system. It utilizes hair cells just like the auditory system, but it excites them in different ways. 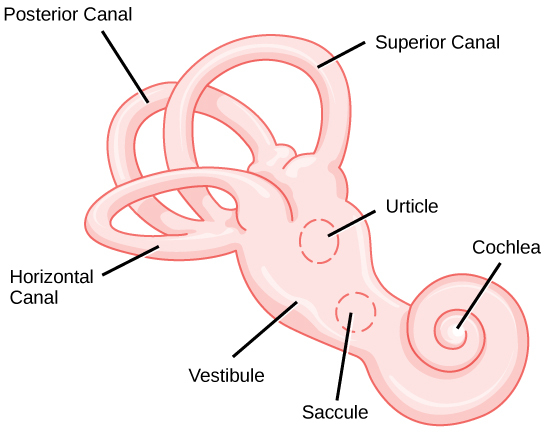 There are five vestibular receptor organs in the inner ear, all of which help to maintain balance: the utricle, the saccule, and three semicircular canals. Together, they make up what is known as the vestibular labyrinth. The utricle and saccule are most responsive to acceleration in a straight line, such as gravity. The roughly 30,000 hair cells in the utricle and 16,000 hair cells in the saccule lie below a gelatinous layer, with their stereocilia (singular: stereocilium) projecting into the gelatin. Embedded in this gelatin are calcium carbonate crystals, similar to tiny rocks. When the head is tilted, the crystals continue to be pulled straight down by gravity, but the new angle of the head causes the gelatin to shift, thereby bending the stereocilia. The bending of the stereocilia stimulates specific neurons that signal to the brain that the head is tilted, allowing the maintenance of balance. It is the vestibular branch of the vestibulocochlear cranial nerve that deals with balance. Vestibular labrynth: The structure of the vestibular labyrinth is made up of five vestibular receptor organs in the inner ear: the utricle, the saccule, and three semicircular canals. The fluid-filled semicircular canals are tubular loops set at oblique angles, arranged in three spatial planes. The base of each canal has a swelling that contains a cluster of hair cells. The hairs project into a gelatinous cap, the cupula, where they monitor angular acceleration and deceleration from rotation. They would be stimulated by driving your car around a corner, turning your head, or falling forward. One canal lies horizontally, while the other two lie at about 45 degree angles to the horizontal axis. When the brain processes input from all three canals together, it can detect angular acceleration or deceleration in three dimensions. When the head turns, the fluid in the canals shifts, thereby bending stereocilia and sending signals to the brain. Upon cessation of acceleration or deceleration, the movement of the fluid within the canals slows or stops. For example, imagine holding a glass of water. When moving forward, water may splash backwards onto the hand; when motion has stopped, water may splash forward onto the fingers. While in motion, the water settles in the glass and does not splash. Note that the canals are not sensitive to velocity itself, but to changes in velocity. In this way, moving forward at 60 mph with your eyes closed would not give the sensation of movement, but suddenly accelerating or braking would stimulate the receptors. Hair cells from the utricle, saccule, and semicircular canals also communicate through bipolar neurons to the cochlear nucleus in the medulla. Cochlear neurons send descending projections to the spinal cord and ascending projections to the pons, thalamus, and cerebellum. Connections to the cerebellum are important for coordinated movements. There are also projections to the temporal cortex, which account for feelings of dizziness; projections to autonomic nervous system areas in the brainstem, which account for motion sickness; and projections to the primary somatosensory cortex, which monitors subjective measurements of the external world and self-movement. People with lesions in the vestibular area of the somatosensory cortex see vertical objects in the world as being tilted. Finally, the vestibular signals project to certain optic muscles to coordinate eye and head movements. With hair cells in the inner ear that sense linear and rotational motion, the vestibular system determines equilibrium and balance states. The hair cells of the utricle and saccule of the inner ear extend into the otolith, a dense viscous substance with calcium carbonate crystals. The otolith slides over the macula, tissue supporting the hair cells, in the direction of gravity when the head is moved due to its greater inertia, causing a pattern of hair cell depolarization interpreted by the brain as tilting. The three semicircular canals of the inner ear are ring-like structures with one ring oriented in the horizontal plane and the other two rings oriented at approximately 45 degrees relative to the sagittal plane. The ampulla, found at the base of each semicircular canal, contains hair cells that extend into the membrane that attaches to the top of the ampulla to an area called the cupula. A head rotation causes the fluid in the semicircular canal to move, but with a lag which produces a deflection of the cupula in the direction opposite to the head rotation which in turn causes the hair cells to depolarize. Using the hair cell depolarization information from all three ampullae, the direction and speed of head movements in all three dimensions can be detected by the vestibular system. Along with audition, the inner ear is responsible for encoding information about equilibrium, or the sense of balance. A similar mechanoreceptor—a hair cell with stereocilia —senses head position, head movement, and whether our bodies are in motion. These cells are located within the vestibule of the inner ear. Head position is sensed by the utricle and saccule, whereas head movement is sensed by the semicircular canals. The neural signals generated in the vestibular ganglion are transmitted through the vestibulocochlear nerve to the brain stem and cerebellum. Together, these components make up the vestibular system. The utricle and saccule are both largely composed of macula tissue (plural = maculae). The macula is composed of hair cells surrounded by support cells. The stereocilia of the hair cells extend into a viscous gel called the otolith. The otolith contains calcium carbonate crystals, making it denser and giving it greater inertia than the macula. Therefore, gravity will cause the otolith to move separately from the macula in response to head movements. Tilting the head causes the otolith to slide over the macula in the direction of gravity. The moving otolith layer, in turn, bends the sterocilia to cause some hair cells to depolarize as others hyperpolarize. The exact tilt of the head is interpreted by the brain on the basis of the pattern of hair-cell depolarization. Linear acceleration coding by maculae: The maculae are specialized for sensing linear acceleration, such as when gravity acts on the tilting head, or if the head starts moving in a straight line. The difference in inertia between the hair cell stereocilia and the otolith in which they are embedded leads to a force that causes the stereocilia to bend in the direction of that linear acceleration. The semicircular canals are three ring-like extensions of the vestibule. One is oriented in the horizontal plane, whereas the other two are oriented in the vertical plane. The anterior and posterior vertical canals are oriented at approximately 45 degrees relative to the sagittal plane. The base of each semicircular canal, where it meets with the vestibule, connects to an enlarged region known as the ampulla. The ampulla contains the hair cells that respond to rotational movement, such as turning your head from side to side when saying “no.” The stereocilia of these hair cells extend into the cupula, a membrane that attaches to the top of the ampulla. As the head rotates in a plane parallel to the semicircular canal, the fluid lags, deflecting the cupula in the direction opposite to the head movement. The semicircular canals contain several ampullae, with some oriented horizontally and others oriented vertically. By comparing the relative movements of both the horizontal and vertical ampullae, the vestibular system can detect the direction of most head movements within three-dimensional (3-D) space. Rotational coding by semicircular canals: Rotational movement of the head is encoded by the hair cells in the base of the semicircular canals. As one of the canals moves in an arc with the head, the internal fluid moves in the opposite direction, causing the cupula and stereocilia to bend. The movement of two canals within a plane results in information about the direction in which the head is moving, and activation of all six canals can give a very precise indication of head movement in three dimensions.